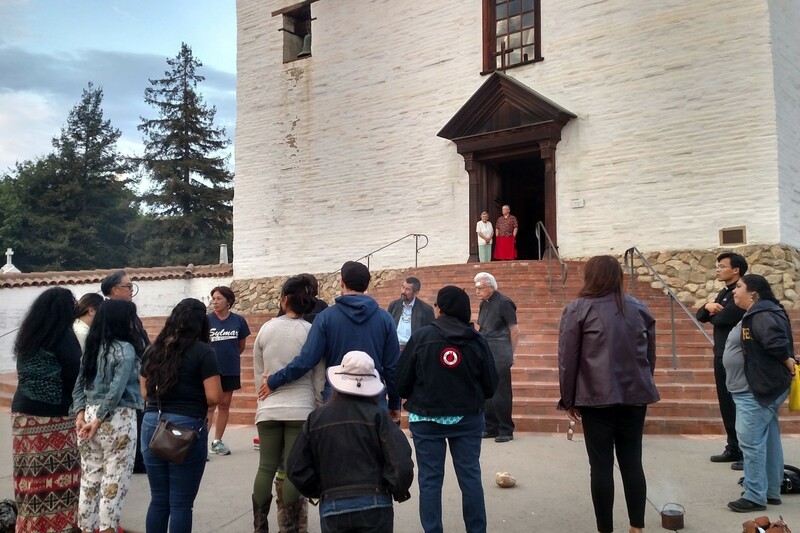 On Monday evening, we reached Mission San Jose after crossing through the wetlands of the South Bay. 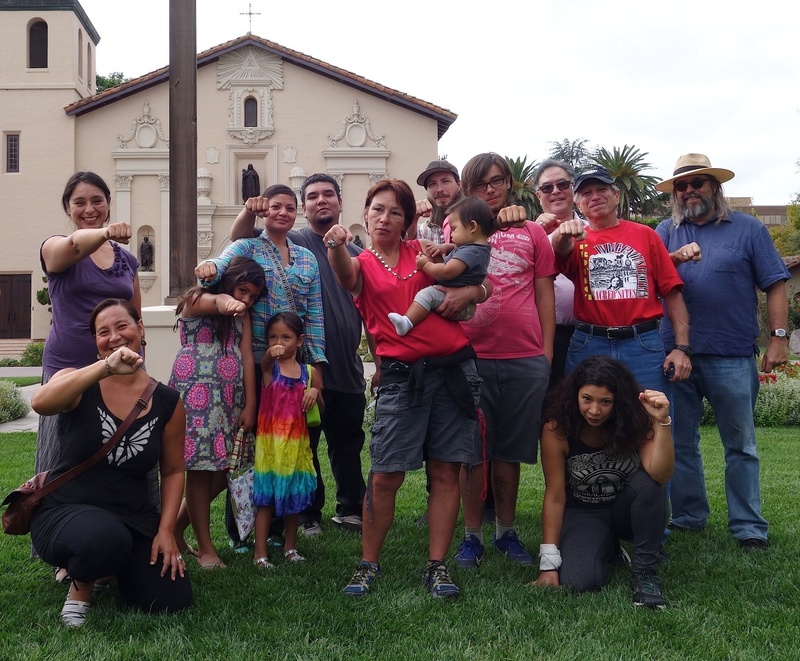 On the steps of the Mission chapel, we were greeted by a strong group of supporters and indigenous people, including Chochenyo Ohlone matriarch Corrina Gould, whose ancestors were enslaved at Mission San Jose. 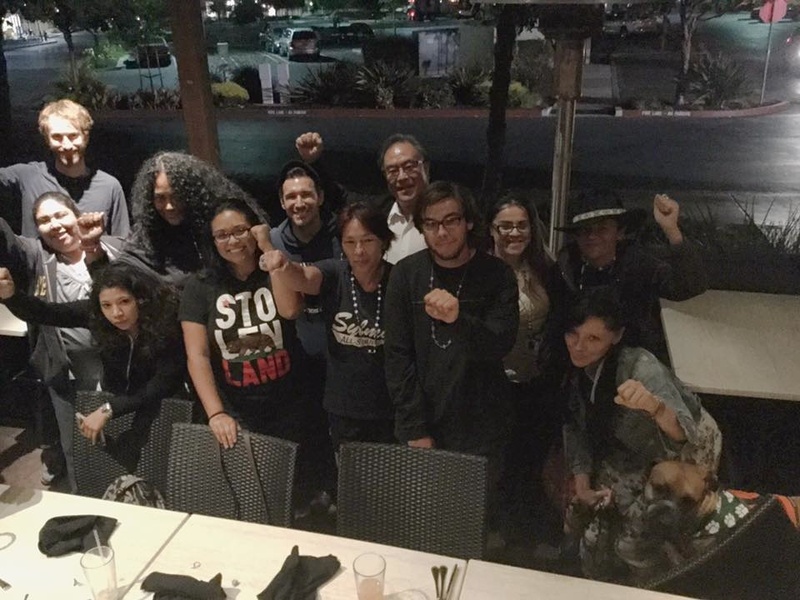 We also encountered Andrew Galvan, an Ohlone descendant who is a paid emissary of the Catholic Church and an outspoken supporter of Serra’s sainthood, and soon found out he’d hatched a plan of his own for the evening. Galvan had arranged for two priests, a deacon, and two nuns to be present, and to have the Chapel doors open, so that we might be beckoned inside. After smudging and holding a circle of introductions and story sharing on the steps outside, we cautiously stepped into the chapel for what became a surreal collision of opposing interests. The controversy around Serra’s sainthood, Galvan explained, has created a prime opportunity to advance his long-held evangelical vision: to bring California Indians back in to the Catholic Church. 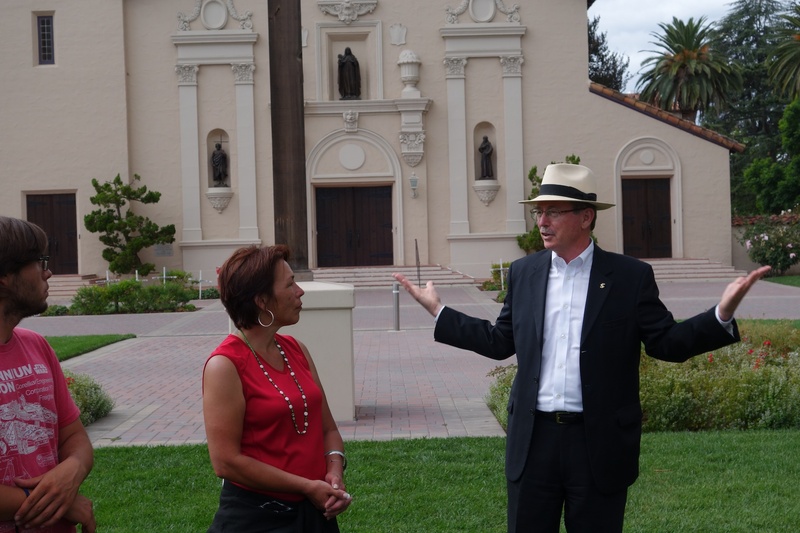 He described ongoing efforts at making the Church a more inviting environment to California’s Native peoples, many of whom have long abandoned the Catholic faith. After a hearty dinner in the company of many wonderful people who sent us off with their heartfelt blessings and gifts, we got started the next morning with an all-day walk to Tamyen Ohlone territory in Santa Clara, joined by five women from Santa Cruz. 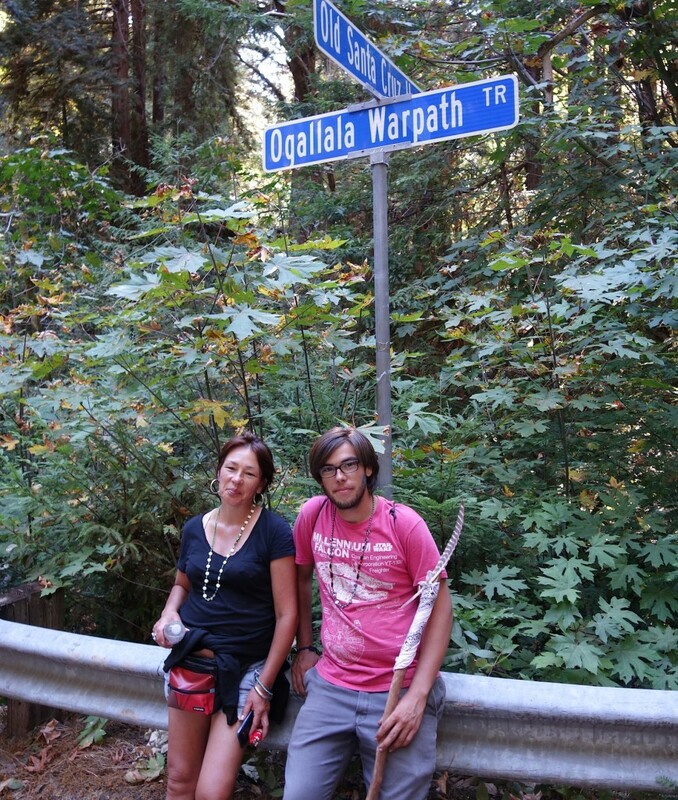 Caroline and Kagen are feeling inspired by how this Walk is connecting them with other indigenous people. 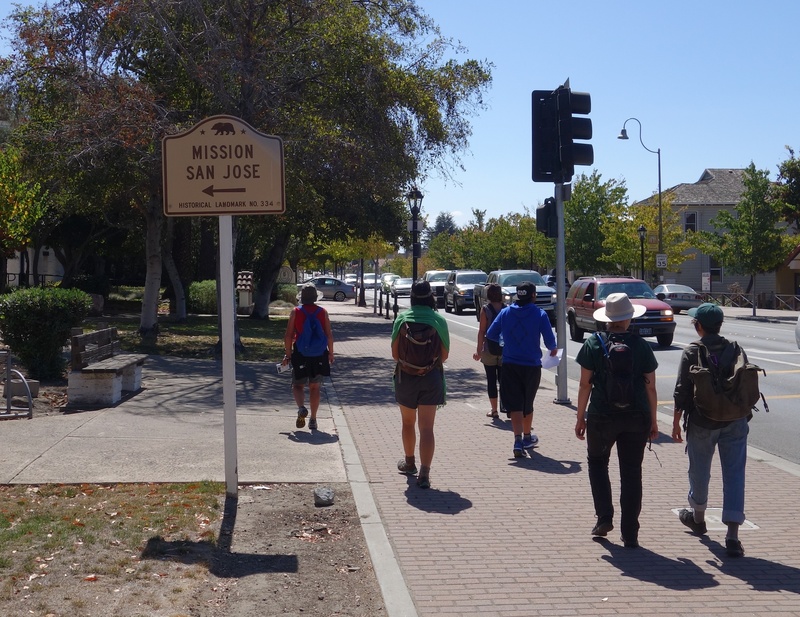 “I am realizing that while this walk is first and foremost about honoring our ancestors, it is also about intertribal relations and building solidarity between all California Indians,” Caroline said. 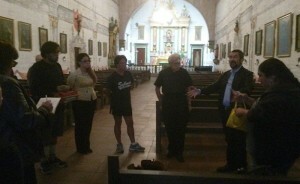 Mission Santa Clara is located on the grounds of Santa Clara University, a Catholic school. According to historian Robert Jackson, between 1777 and 1840, the missionaries recorded 5,691 baptisms of Indian converts, 2,446 births, and 7,076 burials. That translates to a death rate of 86.96% (basically 90%). Despite this shocking number of burials, we could not find any grave markers or any plaques about the indigenous people who perished here. After hearing the stories and prayers of the 16 people who had gathered with us for the ancestors, a twist of fate came our way. The president of Santa Clara University, Michael Engh, happened to come strolling by. Someone in our circle recognized him and asked him to join us—and he did. Michael Engh’s response was sympathetic. “Yes, the question that’s come up because of the canonization, is how do we recognize the people who lived here, who worked and died here. And that is in front of the whole faculty right now. As of last night we were discussing that. And I agree with you, there’s a lot that we need to do.” Yet, he also said that in the hierarchy of the Church, he is only a “little guy,” implying that his perspective is not shared by other officials. 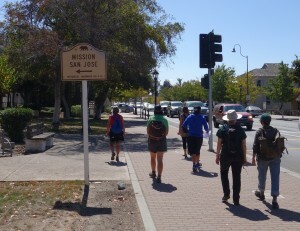 We told him that if this process of reformulating the University’s presentation of the Mission’s history is to have integrity, it needs to involve the input of a range of Ohlone and California Indian people— not just one individual, or one particular Ohlone group. This especially makes sense when you consider that though it’s Tamyen Ohlone territory, other California tribes were also imprisoned at Mission Santa Clara, including significant numbers of Sierra Miwok and Northern Valley Yokuts peoples.